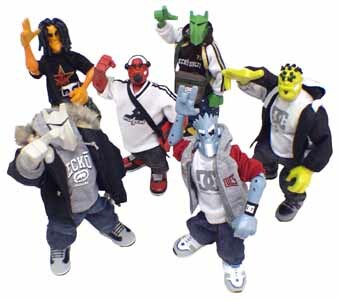 Underground Dwella is a fully poseable figure with 18 points of articulation featuring authentic clothing from Ecko Unltd. This green creature - that looks a little like a rhino - comes dressed in a sports hooded top, funky jeans with white splodges on them, a pair of bright coloured trainers, socks and a bag. I'm going to give this figure an extra mark out of 10 as he is one of the coolest. It's just a personal thing, but I really loved the rhino look.